We just left the keynote for the Samsung Developer Conference, and it was a good day for VR! First up, we got a first look at “Project Beyond”, Samsung’s 360 video camera. Samsung announced their first venture into 3D stereoscopic VR recording during the keynote and showed off a demo of it! Next, we saw the Gear VR in motion as Samsung talked about the Gear VR Innovator edition, and mentioned that headsets would be available starting early December. They also announced the pre-signup for information about the Innovator edition, which you can get to at https://www.samsung.com/us/register/see-the-difference-samsung-gear-vr/ . 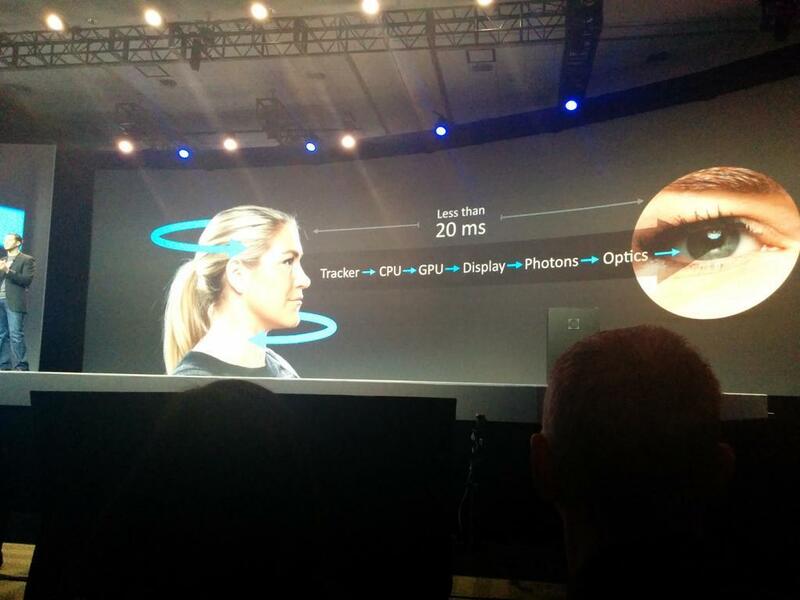 We got some cool information about reducing head tracking latency, which is a huge factor in making truly immersive experiences. Oculus took the stage following to show off some games and discuss the path that they’re taking in partnership with Samsung to make the platform available for a wide range of developers, including a mention to the Unity tools for VR development and a mobile SDK for Gear VR. They also showed demos of some current projects, all of which looked awesome. I don’t think my Cardboard is going to cut it anymore! After the keynote speech was over, I headed down to the exhibition floor – already busy, I headed to where the Project Beyond prototype was set up and saw the camera(s?) up close. Personally, I’m pretty excited to see Samsung getting into the 3D video capturing game – I’m hoping it helps drive down the cost for content creators who want to make immersive film for VR – and the device looked so interesting, like something straight out of a high tech sci-fi movie. Next up, I got my hands on the Gear VR and a 3D video demo that was completely unreal – in the most realistic way possible. I doubt I’ll ever hang off of a helicopter over a waterfall in real life, but the VR experience gave me an adrenaline rush and a perspective I’d never had before (it was mind blowing to be flying through the air over Manhattan and turning to see the top of the Freedom tower at eye level, another 360 degree clip in the demo). In the afternoon, I attended several of the breakout sessions that focused on VR – the first was an overview of the design paradigm changes from 2 to 3D environment development, followed by panel on realtime animation facial mapping and an in-depth talk on the history of VR. I believe at some point the sessions will be made available online, so definitely check back in a couple of days and see. Previous PostSVVR Meetup & A New Unity Project!